A consultation with Nourishing by Nature involves much more than just looking at your diet and recommending healthy changes to what you eat. Taking a Functional Medicine approach uses each person’s unique story as a key tool for integrating diagnosis, signs and symptoms, and evidence of clinical imbalances into a comprehensive approach to improve both your environmental inputs and your physiological function. To help with this, prior to your initial consultation you will be asked to complete a comprehensive health questionnaire which covers your entire health history, a food diary and possibly other questionnaires depending on your objectives. I will analyse these prior to us meeting and use them as the basis of our discussion to try to get to the root cause of any health issues. This pre-analysis allows us to better use our time during the consultation. Here I will further build on the information provided in your questionnaire exploring your health history, stress levels, psychological and emotional factors and dietary and lifestyle habits. I may also use techniques such as tongue, or nail diagnosis or mineral testing to get a more complete picture of your current health. I often use functional testing to help us get to the root cause of problems using quality laboratories or, where possible directing you back to your GP or consultant. With a fuller picture of your current health and wellbeing we will then discuss possible root causes of your problems and work together to create a tailor-made nourishing programme and an action plan. I will always aim to add nourishing foods into your diet rather than removing your favourites and we will look at how to make simple changes to your current meals as well as providing you with new recipes for inspiration. Everything will take into account your dietary and lifestyle preferences so you feel 100% confident you can maintain changes. A fundamental part of your programme will focus on diet and lifestyle though I may also recommend nutritional and herbal supplements deemed as beneficial to boost your programme or based on functional test results. Lasting 45 minutes, we will discuss how you are getting on with your programme, review any test results and refine and adapt your programme to help aid continued improvement. This is often recommended 4-6 weeks after your initial consultation depending on progress. Again a fully typed dietary and lifestyle programme/personalised report will be provided. Are you looking to feel healthier, more energised, more focused, more able to handle the stresses of everyday life? Maybe you are looking to lose some weight, you have chronic health problems you want to address or wish to help prevent health issues in the future? Put simply are you looking to be more able to lead the life you truly desire? If any of the above sounds appealing to you then this nourished and VIBRANT programme is for you. This 4 month programme is for anyone committed to achieving optimum health so they can live a full and vibrant life! If you’re like most people, you’ve experimented with different diets and exercise regimes all in the hope of achieving better health and feeling great. No doubt you will have read various books and may even have seen a number of health providers along the way. Some things may have worked but many things haven’t. Why have things not helped you when they help others? The answer is simple – we are all unique, we have a unique biochemistry and therefore no generic health programme works for everyone. On this nourished and VIBRANT programme I will work with you on an individual basis to find solutions that work with your unique biochemistry. You will have a complete health M.O.T. looking to optimally balance of all your bodily systems –e.g. your digestion, your hormones, your immunity, your ability to detoxify etc. The programme also includes a laboratory test to look the health of your adrenal glands (stress glands) so we can see if stress is having a detrimental impact on your health and how you feel. This non-invasive saliva test, measures your key stress hormone cortisol throughout the day as well as your DHEA (your anti-ageing hormone) plus a marker to see what impact stress is having on your immune health. We discuss your lifestyle, your health history, your family history, your nutritional likes and dislikes and then armed with all this information plus the results from the health questionnaire and adrenal test we can create a personalised health programme just for you, to suit your biochemistry. This is not a 4 month diet or one off regime. This is a programme designed to change the way you live and eat for the long term in a way that is not only perfectly suited to your unique biochemistry but manageable, enjoyable and leaves you feeling nourished and vibrant and ready to really live your life to the full. What will I get with the programme? This package includes a one-to-one consultation in the comfort of your home with the addition of a kitchen audit. I will take an in depth look at the foods in your freezer, cupboards and fridge and advise you how to improve their contents to best fit with your new nourishing programme. This package is a cost effective way to get hands on advice on how to stock your home with the foods that are best for you. A 45 minute consultation for those who are not looking to address any specific health issues, but simply want advice on improving their diet to meet health goals.. You will be asked to fill in a detailed 3 day food diary which I will then analyse and then be used as the basis for our discussion. We will look at when you eat, what you eat, how you feel about food and then work together to come up with simple and effective changes creating a dietary programme aimed at nourishing you to optimum health via long-term change. This includes the My Optimal Diet™plus 4 weekly calls lasting 15 minutes each. During these calls we will discuss your progress, and fine-tune your programme so that we can be sure the changes you make are realistic and hence long-lasting. Available in your own home for as many of your family as you wish. All will receive an individual consultation and tailor made nourishing programme but care will be taken that the programmes work together to enable easy planning and cooking for the family as a whole. A kitchen audit can be included if required. 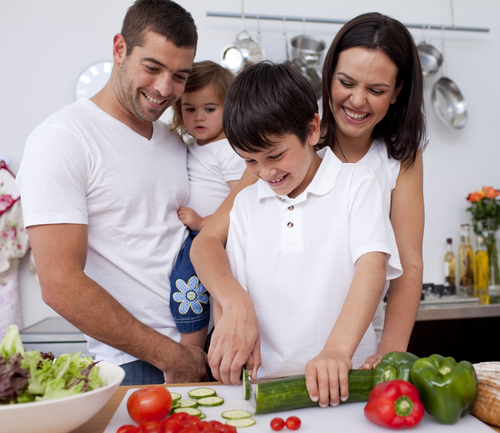 This is a cost effective way to promote optimum health for the whole family. Taking 60-75 minutes, this is ideal for anyone who is daunted, confused or stressed by; bored of, or simply dreads their weekly trip to the supermarket. I will meet you in the supermarket of your choice (within Cheltenham) and we will do your weekly shop together. We will look at how to make healthier food choices, how to avoid the traps of the thousands of offers as well as how to unravel confusing food labels. Together we will create a basic weekly shopping list and/or a weekly meal plan which can be used for weeks to come whilst also giving your the confidences and inspiration to make nourishing purchases and create healthy meals for the whole family, all within your budget and lifestyle. Before we meet I will ask you to send me a typical weekly shopping list so I can get an idea of how you are currently shopping and tailor our tour so you will get the most out of it. For further information including the latest prices and to find out which of the above would be right for you please email laila@nourishingbynature.co.uk or call me on 07768 056 048. My digestion sorted itself out within a week, I had more energy than I had in months and felt much more like I did before I got pregnant. I even got back into my pre-pregnancy jeans!